There is a barcode generation limit of 10MB per export for the Free Plan and a 100MB per export for a Paid Plan. The number of barcodes that limit represents depends on the image used and the barcode size. The typical size for a Standard (non-branded) barcode is 5KB. The typical size of a Branded barcode is 25KB total. That assumes a small image size – e.g. 120×120 pixels. If your uploaded image is too large your barcodes will not be generated. As a guideline upload a 25KB image or less. Try a smaller image if you don’t get your barcode images emailed to you. Barcode generation is queued. If you have a lot of barcodes to generate it may take 10-30 minutes or more to generate and email the link to the image zip file. Every time you export your images we re-generate barcodes for all the values in that database – even if you’ve already exported them. To export a smaller subset of new barcodes you can create a new database just for exporting. Be sure to also add those values to your production database. If the number of values in your database exceeds the 10MB or 100MB limits you will need to export multiple times or reduce your uploaded image size and/or choose a smaller barcode size. 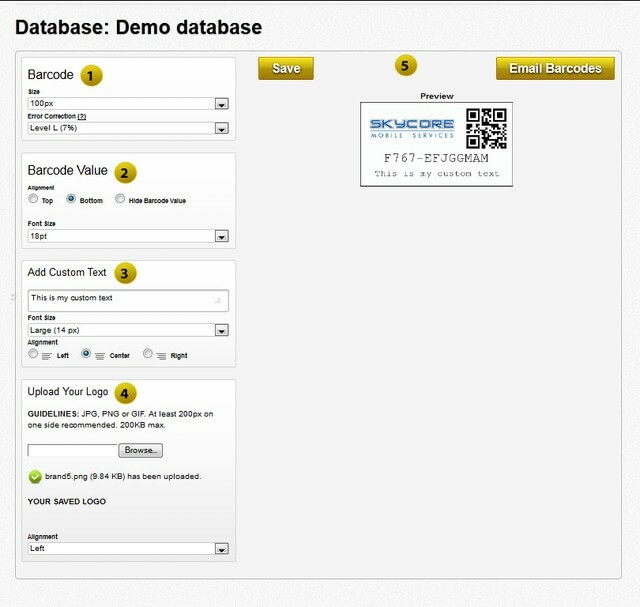 Here is how you can create and brand your barcodes: Click on the ‘Databases link on the main page’s navigation bar. You’ll see a link to ‘Export Barcodes’ on the right hand side – click on that to see a choice to generate Standard and Branded barcodes. Click ‘Create a Template’ and you will be redirected to the page below. Scroll down for an explanation of each element of this page. The ‘Barcode Value’ box allows you to choose where on the barcode the value should be, as well as how large the font of the value will be. 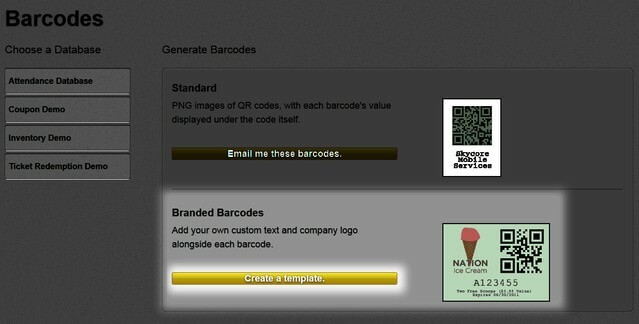 The ‘Add Custom Text’ box lets you write a custom message to be put alongside the barcode image. You can also choose the size of the font and the alignment of the text. The ‘Upload Your Logo’ box is where you upload the desired image. You can also choose where the image will be relative to the barcode image. This is the preview. Make sure to press ‘Save’ so that your changes aren’t lost. You can also email the account email these barcodes by pressing ‘Email Barcodes’.